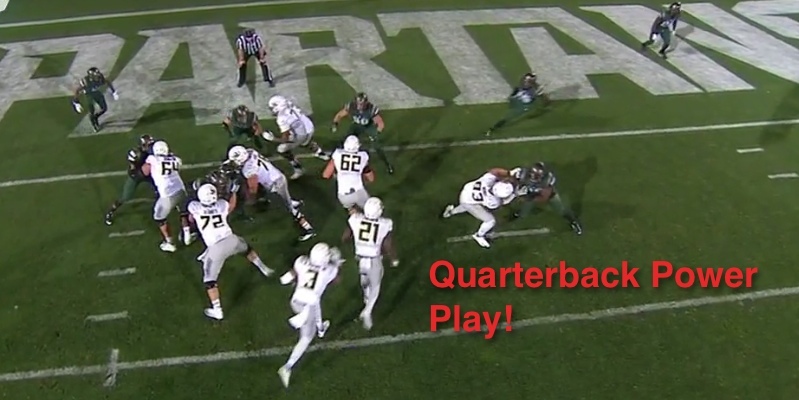 An Oregon Innovation: the Quarterback Power Play! Can we learn from a tough loss? In the case of last Saturday’s game, absolutely – especially with an opponent as talented as Michigan State. 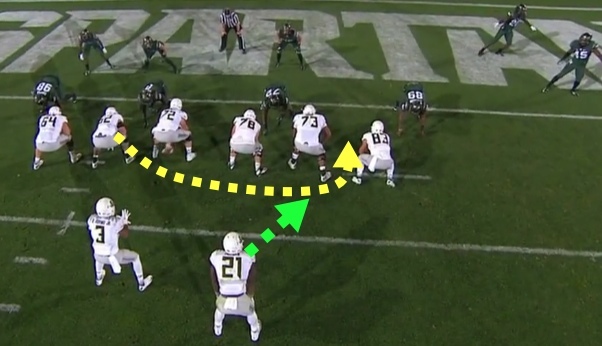 The Oregon game plan featured a new play variation of the new Oregon Power Play featured last week: a Quarterback Power Play. 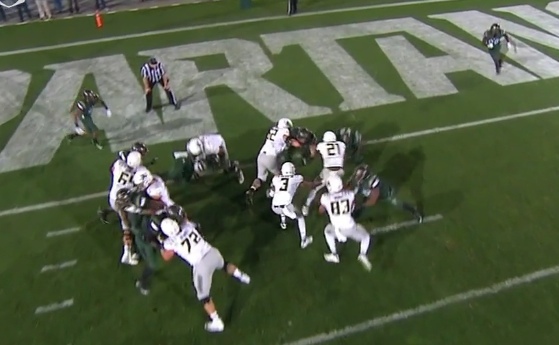 It sounds odd, considering Oregon QB Vernon Adams is on the smaller side, but let’s look at how the Ducks took on the intense goal line defense of the Spartans and won with this innovative look. Taking on NINE in the box? The first example (above) is actually a traditional Power Play, which helps us to understand how the play works. In this case, the Ducks take on nine defenders in the box and score! No. 63 offensive guard Matt Pierson (Dotted yellow line/arrow) will pull on the play and run through the guard/tackle “B” gap on the right side. Royce Freeman (green dotted line/arrow above) will follow him through the “B” gap. Wonderful blocking by the offensive linemen! After pulling, we see Pierson (yellow arrow above) getting snagged by the defensive line push before he turns the corner. Evan Baylis (green arrow above) is fighting like crazy to sustain his block. He wants it more! 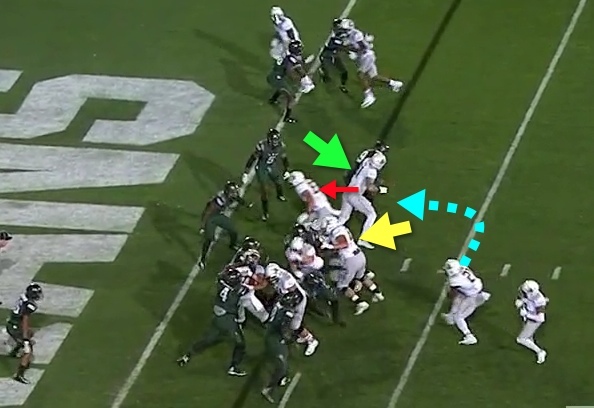 The red arrow above is the H-Back – Johnny Mundt – who is charging a Spartan inside linebacker with evil intent. Above we see Freeman (green arrow) following the superb blocking by the offensive line and tight ends. There is a clear path paved for him! Quite a few Ducks blocking at the point of attack. You can clearly see Freeman’s head and ball (above) are just above the goal line, resulting in six points. This is a traditional Power Play where Oregon pulls the guard and has two tight ends at the point of attack to help clear the way. There is really some superb blocking going on to defeat the nine defenders in the box. So now let’s take a look at the new Quaterback Power Play! This play will begin as the normal Power Play does with the offside guard pulling (yellow dotted line/arrow above) and Freeman following him into the hole (green dotted line/arrow above). What a beatiful sight to behold for old offensive linemen! For an old offensive lineman like me, what you see above is football poetry. 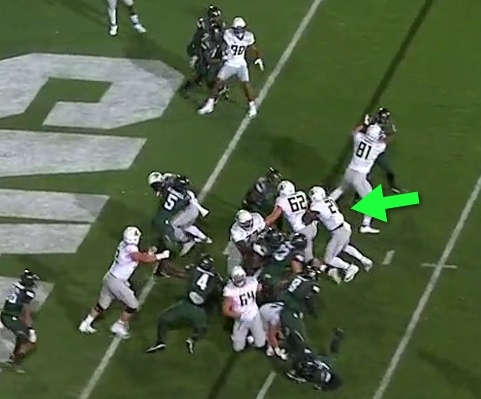 Mundt (red arrow above) is securing the edge in a savage battle with the MSU defensive end. 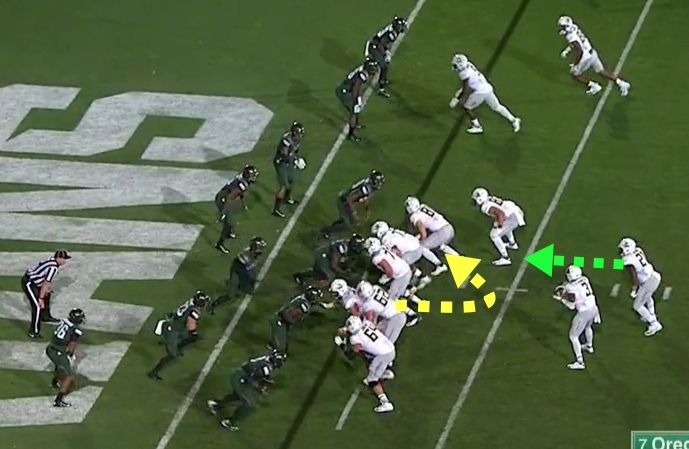 Pierson (yellow line/arrow above) is about to have a play-date with a Spartan inside linebacker, while Tyrell Crosby (black arrow above) helps to seal off the right side by blocking down on a Michigan State defensive tackle with Cameron Hunt (No. 78 above). 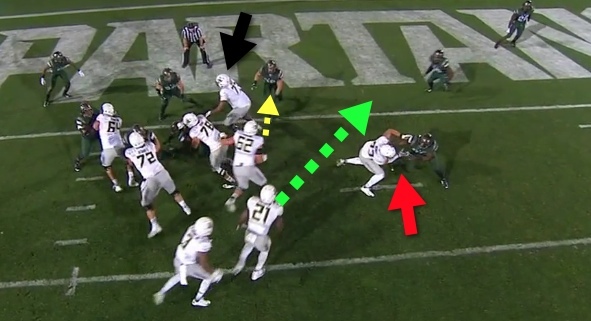 Royce Freeman (green arrow above) is performing the same function as the second tight end in the original Power Play. He is leading up in the hole to pulverize the Spartan outside linebacker, clearing the way for Adams. The running lane becomes obvious. As you can see above, no arrows are needed to see what Adams sees: a wonderful running lane and a clear hole to dash into the end zone! From all angles above, this play is a wonderful score, made possible by simply incredible blocking by everyone on the offensive unit. The Quaterback Power Play is cool new innovation to help Oregon punch it in inside the Red Zone! The traditional Power Play allowed the Ducks to overcome a numerical disadvantage at the goal line by attacking one gap with two additional blockers in the pulling guard and the H-Back. The Quarterback Power Play accomplishes the same thing by substituting the H-back as the lead blocker with the running back, in this case Freeman. I especially like how the Ducks can run this play anytime without tipping off where they are going to attack. It is a wonderful addition to the deep Oregon playbook!